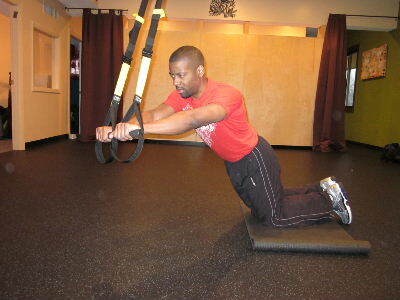 There are a variety of trx stomach exercises and core exercises. The regular plank roll out with the trx works all the stomach muscles, but when you go off to the side you significantly increase how much the obliques work. The obliques always work harder when your trunk moves into side flexion or rotation. Starting Position: Simply kneel on a mat so that your knees are comfortable. Hold on to the trx handles with your palms facing your thighs. Form: While keeping your abs and core engaged and your arms straight, slowly extend your arms out in front of you. As your arms get 6-12 inches away from your body, slowly start to move your arms over to the left side, and then use your stomach muscles to pull you back to the starting position. Then, simply repeat the same motion on the right side. Personal Trainer Tips: This exercise can be really challenging on the lower back, so it's important to pay attention to your form and keep your stomach and core muscles engaged throughout the entire exercise. The further you allow your arms to move away from your body, the harder the exercise becomes. So limit your range of motion to a level that you can control. 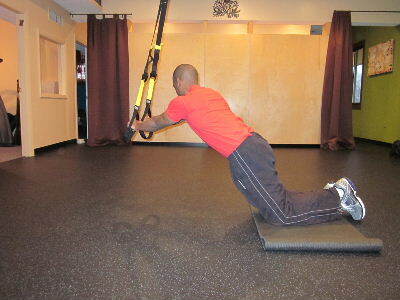 Before starting the oblique plank roll out, build up with the regular trx plank roll out. I personally think the trx is a great fitness tool. It's portable and light weight, and it can be used in the home, in the gym, or outside. If your gym has the trx system, ask a trainer to show you a few moves and check to make sure that you're using proper form. 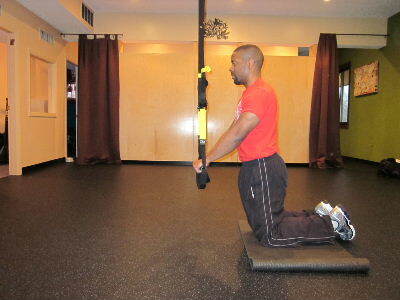 But if your gym doesn't have a Trx there are still so many different stomach exercises your can do without equipment. So it's all good!